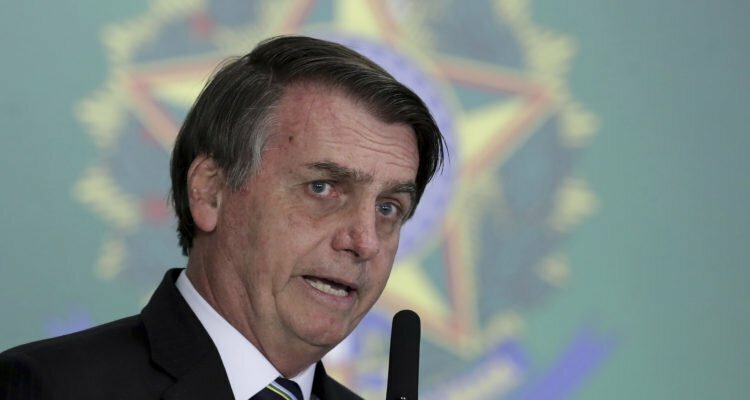 President Jair Bolsonaro of Brazil clarified on Sunday the controversial statement that he made on Thursday in which he said that “crimes of the Holocaust can be forgiven.” He said that forgiveness is a personal act and reaffirmed his abhorrence of the Nazis’ attempt to exterminate the Jewish people during the Second World War. “To the people of Israel: I wrote in the guestbook of the Yad Vashem Holocaust museum in Jerusalem: ‘Those who forget their past are doomed to not have a future.’ Therefore, any other interpretation is only in the interest of those who want to push me away from my Jewish friends,” Bolsonaro wrote to Yossi Shelley, Israel’s ambassador to Brasilia. “Forgiveness is something personal, my speech was never meant to be used in a historical context, especially one where millions of innocent people were murdered in a cruel genocide,” he added. Shelley posted Bolsonaro’s words on his Facebook page Saturday night. A fervently religious Christian, Bolsonaro made his contentious remark during a meeting with evangelical pastors in Rio de Janeiro on Thursday. They greeted the statement with applause, as forgiveness is a core theme in Christianity. Elected in October 2018, the Brazilian leader is a staunch friend of the Jewish state. In March, during his first trip abroad as president, he announced that his country will open a trade office in Jerusalem as “part of its embassy in Israel.” Bolsonaro has already reversed the way Brasilia votes in the United Nations, now more in Israel’s favor. And when he met with the Christian leaders, he also spoke of the necessity of action, not only words, to ensure that the Holocaust never happens again. Nonetheless, both Israeli President Reuven Rivlin and Yad Vashem harshly condemned Bolsonaro’s statement. In an attempt to defuse the situation, Ambassador Shelley defended the president. He said that Bolsonaro neither demonstrated any lack of respect nor made light of the suffering of the Jewish people during the Holocaust. Israel’s foreign ministry made no statement in reaction to the Brazilian president’s comments.